The results? I'm not a fan of BLT's (at least the LT part of them) ~ but supposedly, Skillet Bacon Jam on a BLT is crazy good! (You'll have to let me know, 'cuz I'm not planning on eating one) I found other suggestions, including burgers, grilled cheese, cooked with scrambled eggs, or quiche. You can also use it in a vinaigrette. (think hot bacon dressing, maybe?) Basically, any recipe you would use bacon in, you can make with Bacon Jam. So far, I've tried it on a turkey & swiss sandwich - divine! and with scrambled eggs on half of a bagel. I can't stress enough how tasty this Bacon Jam is. If you are a fan of bacon, you will really enjoy Skillet Bacon Jam! I think it has a smoky, barbecue flavor, and the bacon flavor really stands out. It's a savory but sweet condiment that you will have a blast experimenting with! 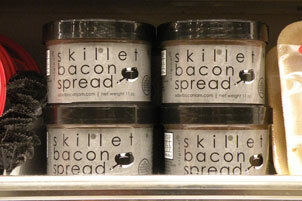 I would love to hear your recipes or ideas for using Skillet Bacon Jam. Try it, and let me know what you think! I was checking out their website and they have some great dishes using this spread. Who knew you could do so much with bacon? It's not just for breakfast anymore. Thanks for the review of this product!